We tried all of them — and here are the ones that were worth it. 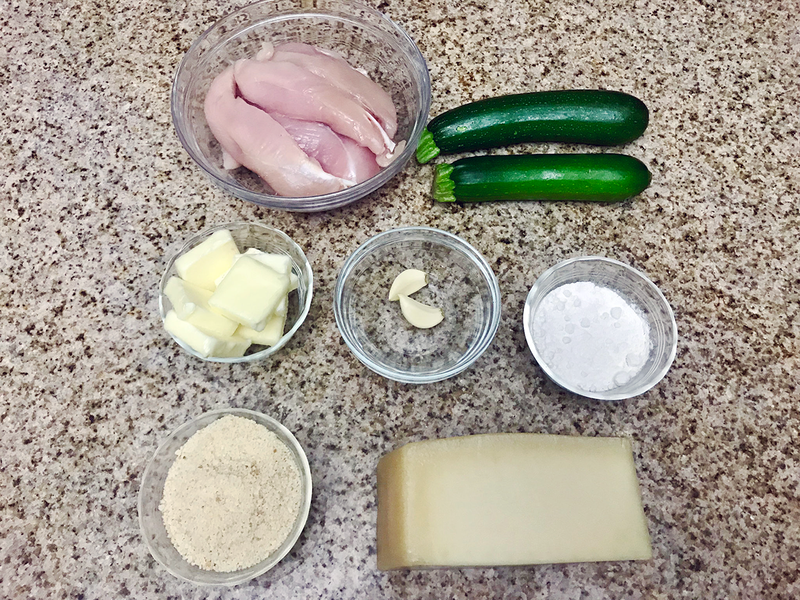 Chicken is a go-to dinner for a lot of us, but if you eat it often, it can become predictable and boring. That's where Pinterest comes in. It's got tons of new recipe ideas, but sometimes it's hard to know what's really good and what's a waste of time. • The prices of the meals had to be reasonable. Meat is expensive, and we're on a budget. • The recipes all had to be pretty quick and easy, because no one has time for something very involved on a weeknight. • We had to cook each meal in our own (small) kitchens and not make any big changes to the recipes. What he thought: Listen, I LOVE pasta. You could literally hand me a bowl of dry AF spaghetti noodles and I will happily snack on them ― so, this review might be a tad biased. Anyway, the first thing I noticed about this recipe is that it takes a decent amount of ingredients (nine, to be exact) to make. 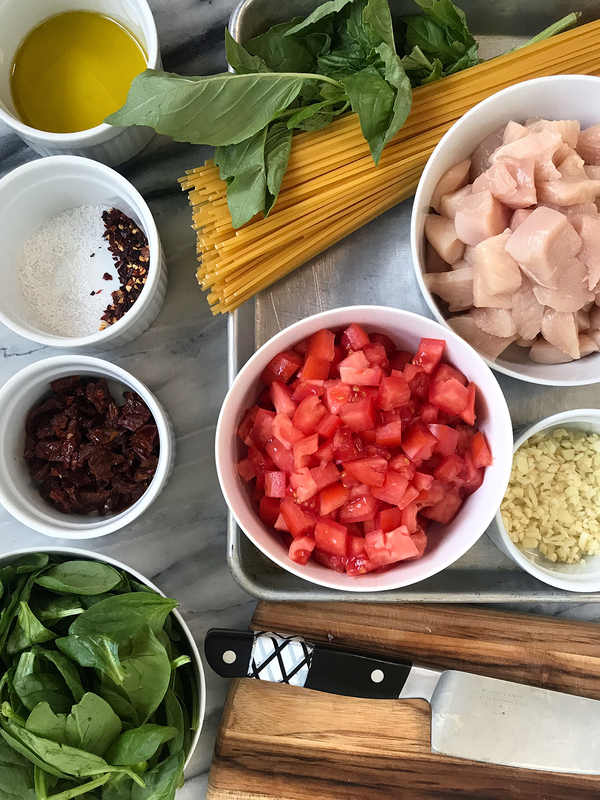 Although nine ingredients doesn't sound like much, my pastas are usually super simple and budget friendly. The most expensive ingredient was a jar of sun-dried tomatoes, but they turned out to be pretty necessary for flavor. 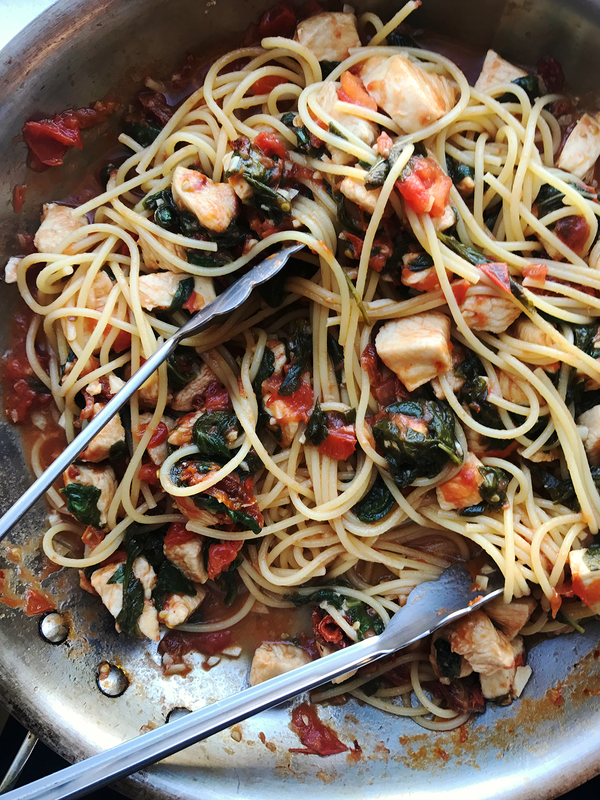 The pasta itself is super easy to make — you just sauté chicken with tomatoes, spinach, and a few spices and dump the pasta in. The Roma tomatoes release a ton of juices that create a sauce that clings to the pasta. It's light, healthy-ish (I mean, for pasta), and you're only left with a few dishes to clean. My roommate (who has never cooked a meal in her life) happily ate it but described it as pretty basic ― and I somewhat agree. The pasta is perfect for a quick weeknight dinner, but I wouldn't recommend it for a date night or in-laws visit (that's reserved for those fancy pesto pastas, ya know). If I were to make it again, I would add a sprinkling of cheese at the end (because IMO, pasta without cheese is a crime) to amp up the flavors. 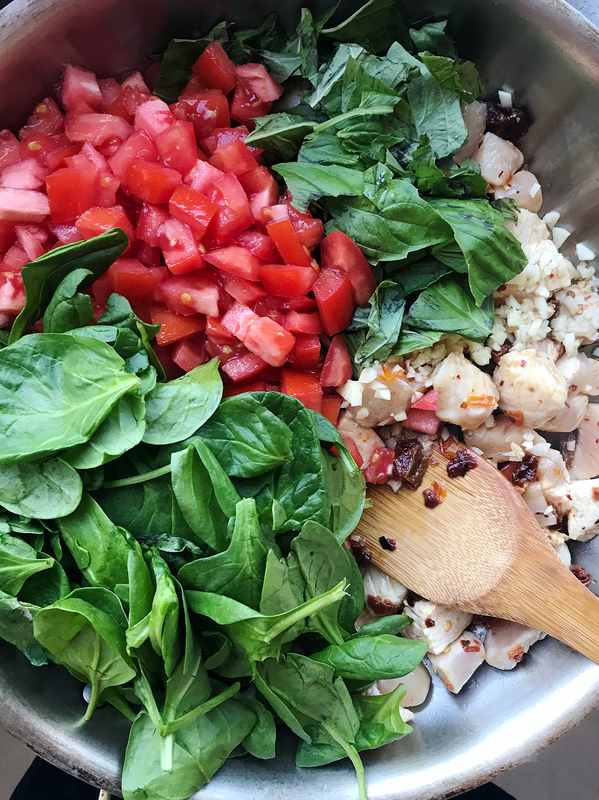 The pasta IS a good way to get your veggies in ― it's loaded with an entire bag of spinach and four tomatoes, so if you're looking for a pasta that's on the lighter side, give this recipe a try. What she thought: I love pesto. But for some reason, I've never thought to try the sauce on anything other than pasta. 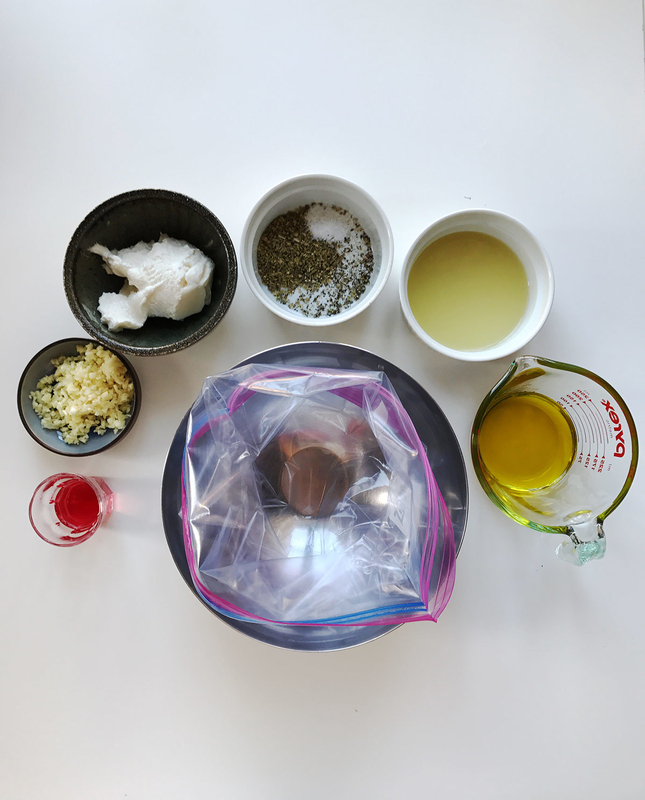 And this recipe was a big fat reminder that I need to start trying ingredients outside of their most common uses. The whole thing is easy to pull together — mostly because you’re buying ready-made pesto instead of trying to make it from scratch. 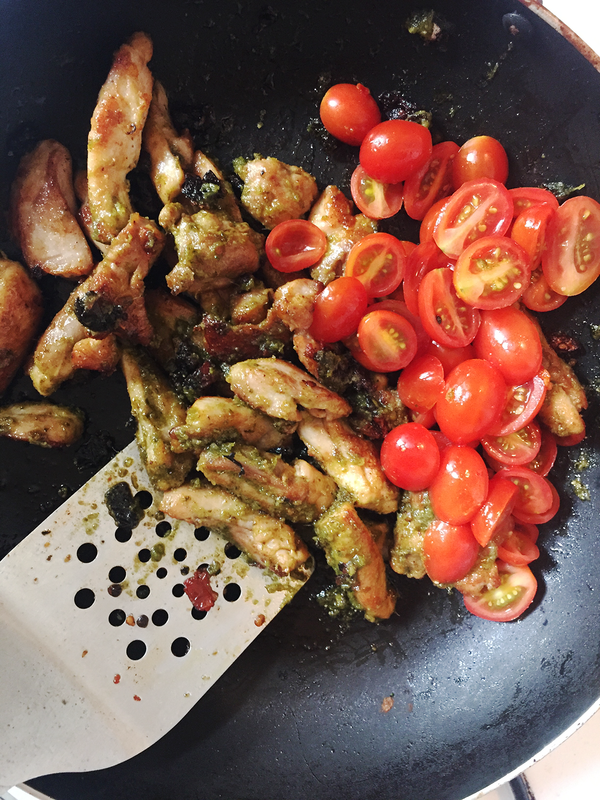 So once you have the pesto, it’s just a matter of chopping everything up, taking turns cooking the thighs and the vegetables, and then mixing everything together. Having made it once, I think I could whip this whole thing up in 30 minutes or less. The only thing I would do differently is wait to cook the chopped sun-dried tomatoes. The recipe says to cook them with the thighs, but by the time my chicken was fully cooked, the tomatoes were a bit burnt. Despite the slightly burnt tomatoes, the whole thing was SO FORK-LICKIN’ GOOD. 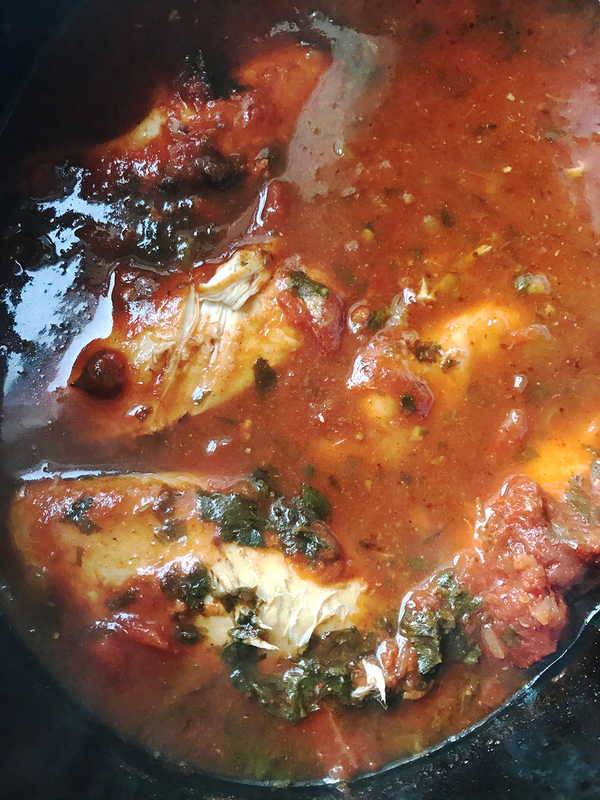 I love that the recipe calls specifically for flavorful chicken thighs — my personal favorite cut of chicken — and that the pesto added just the right amount of oil, savoriness, and moisture. A pound of chicken thighs yielded about four servings (just as the recipe says), but if you serve it with some sliced bread like I did, I think you could stretch it out to five servings. Also, if you’re on a Whole30 kick, a friend told me you can make the dish compliant by making your own pesto. 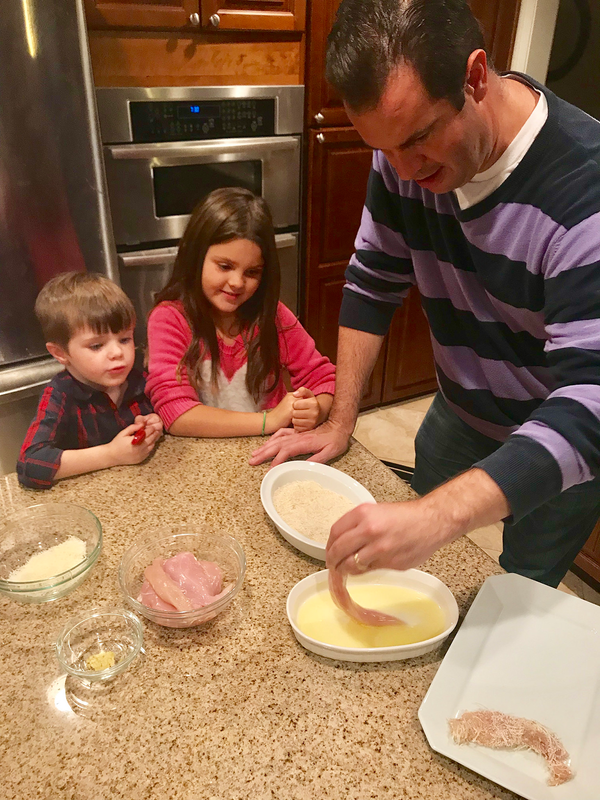 What he thought: As a dad, one of the biggest struggles of cooking for my kids is trying to make something they will want to eat that is also (at least somewhat) healthy. 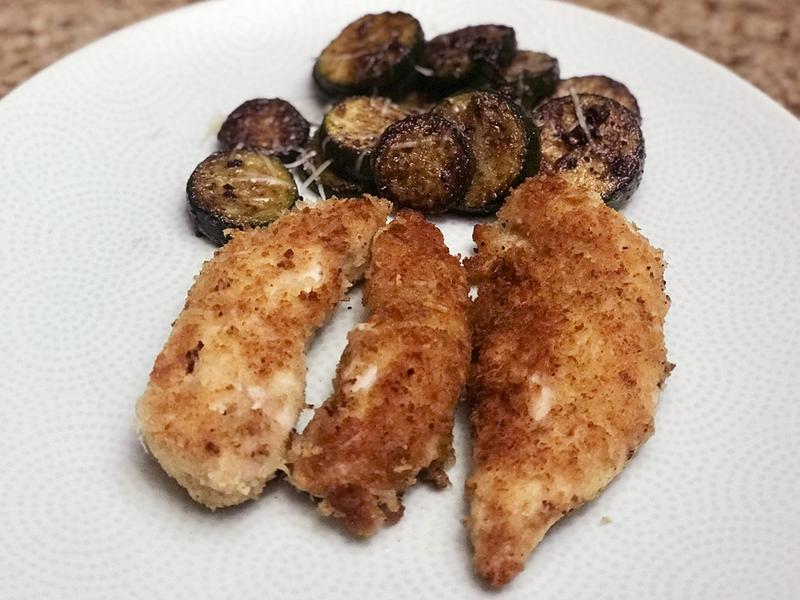 When I saw this recipe I knew they would eat the crispy parmesan garlic chicken — but the zucchini would be a tougher sell. Well, I never run from a challenge (or maybe I just really like to hear my kids whine, “I don’t like it!”), so I gave it a shot! 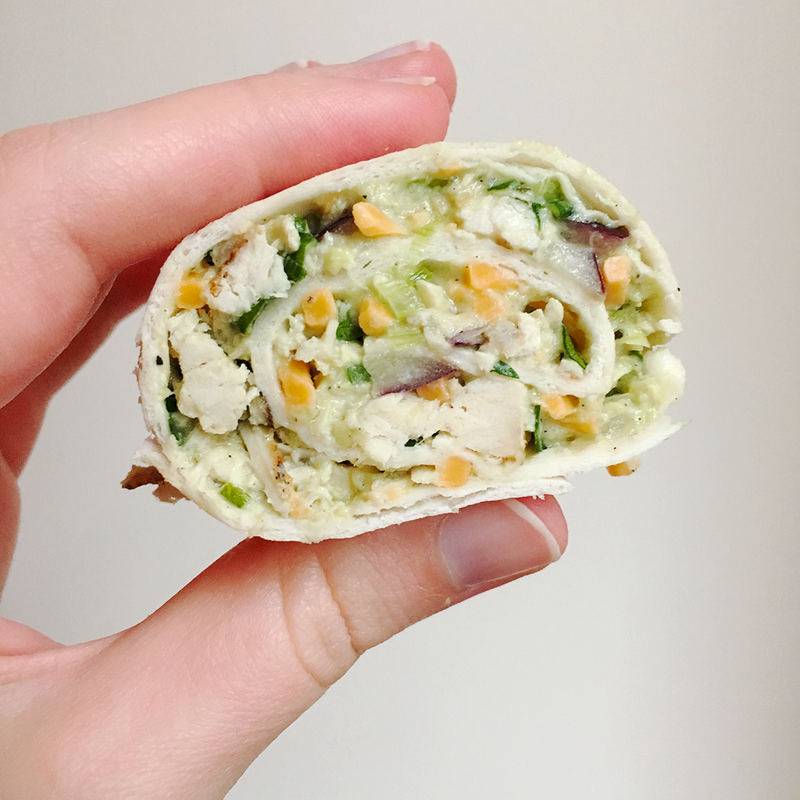 Regardless of whether you have tiny humans to feed or not, this meal is super easy to make. The recipe said it would take about 25 minutes total, which was true. (And it wasn’t 25 stressful minutes where you were staring at the recipe trying to figure out how the heck to do step 4.) It was so easy that I even let my kids — Annie, 7, and James, 4 — help. Letting kids help prepare a meal is a good idea because they end up more invested in eating it, since they helped make it. As the chicken browned, I heard a lot of exclamations like, “Ooh! Yummy!” But as I prepared the zucchini I heard stuff like, “I don’t like zucchini! I don’t want it!” (And that was from my wife!) The zucchini gets cooked in butter, garlic, and parmesan, though, so it soon started to look pretty good in the pan. Once everyone dug in, it was clear the chicken was a hit. It tasted fantastic with lots of flavor, but wasn’t as heavy or greasy as, say, fried chicken. As for the veggies, James took only the required couple of bites to earn dessert, but Annie said, “I like it and I don’t like it,” as she ate way more of it than I expected. When it comes to veggies and kids, “I like it and I don’t like it” is a rave review. Overall, my wife and I were big fans of this recipe for ease of making it, taste, relative healthiness, and cost. What she thought: This may be the easiest recipe I've ever made. You literally just dump all the ingredients — except for the tortillas — in a slow cooker and cook on high for four hours (or on low for six hours). The only prep you need to do is juicing the limes and roughly chopping the cilantro. That's it! It's also fairly cheap, which was a plus. The result was... OK, but not mind blowing. The chicken was a bit too dry, but I guess that's what you get for cooking chicken breasts for so long. The flavors were pretty good, but it was definitely missing something. 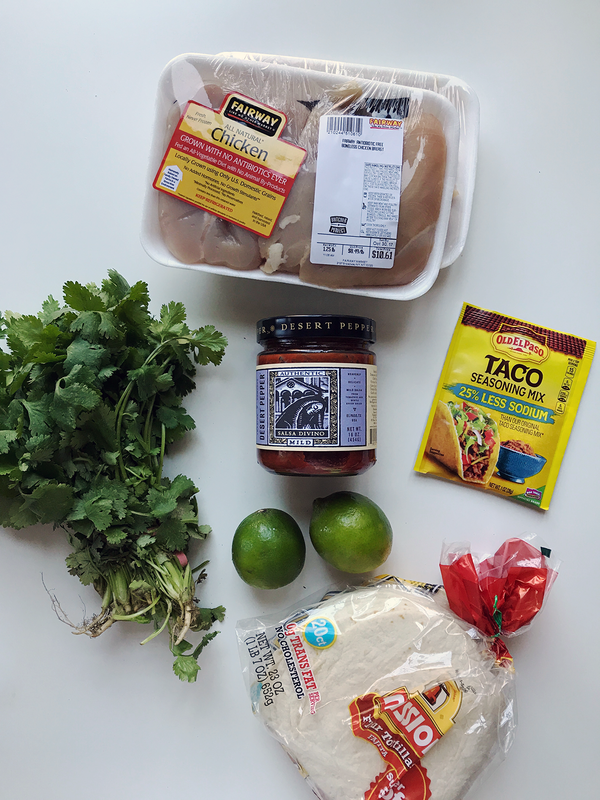 If I had to make it again, I'd use a spicy salsa to add some kick to it, and I'd also add the cilantro at the very end so it keeps more of its flavor. 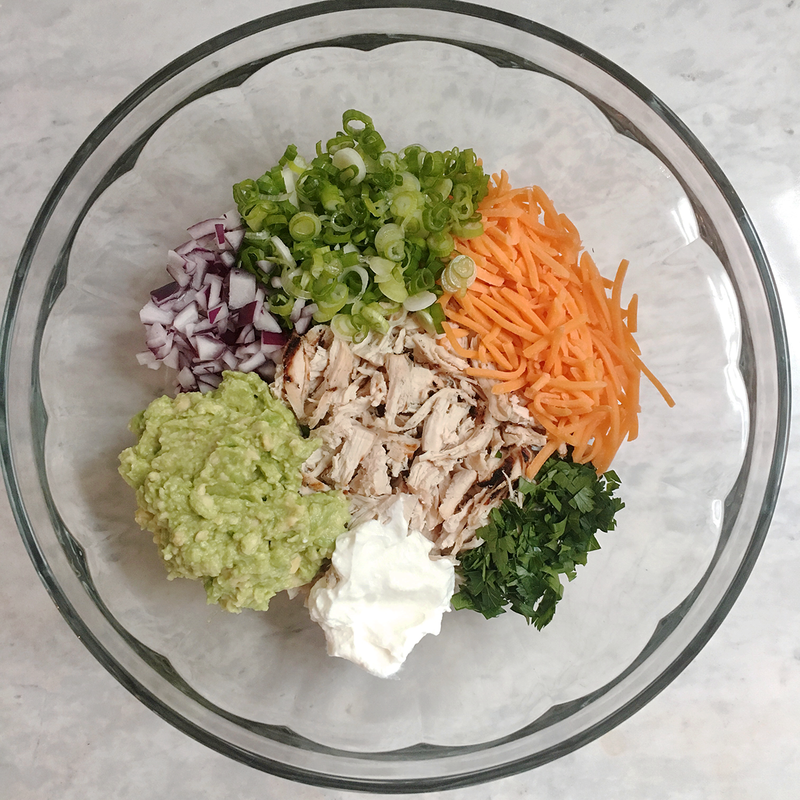 I'd also recommend serving it with some fresh and flavorful toppings — avocado, radishes, sour cream, etc —to bring everything to the next level. What she thought: I eat salads pretty often for lunch, so I usually tend to make something different for the evening. And my boyfriend, who has a very big appetite, usually scoffs at the idea of salad for dinner. But given how filling, simple, and insta-worthy this honey mustard chicken salad looked, I thought it was worth a try. 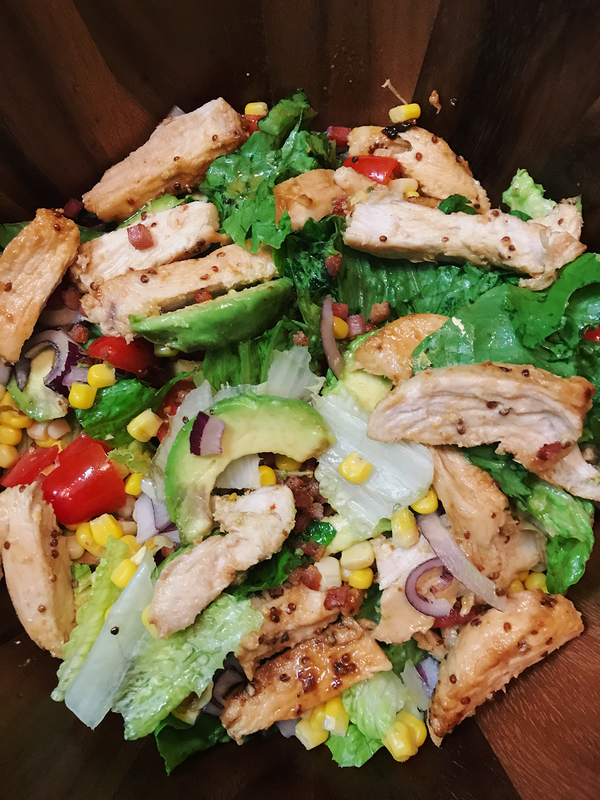 The best part of this recipe is the simple 5-ingredient dressing (honey, smooth dijon mustard, whole grain mustard, oil olive, and garlic) which doubles as a chicken marinade. Not only did it make the chicken super flavorful, but I'd eat this dressing on pretty much anything. 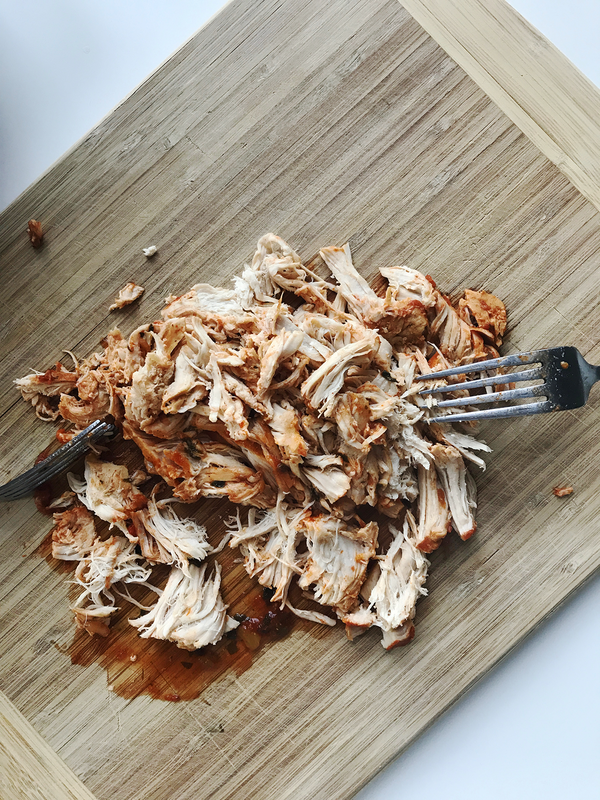 While the recipe itself is very simple (basically just cooking chicken and assembling a salad), you have to plan ahead to give the chicken plenty of time to marinate. I let mine marinate for about two hours, but I wish I had let it marinate overnight. This salad is essentially a souped-up Cobb. 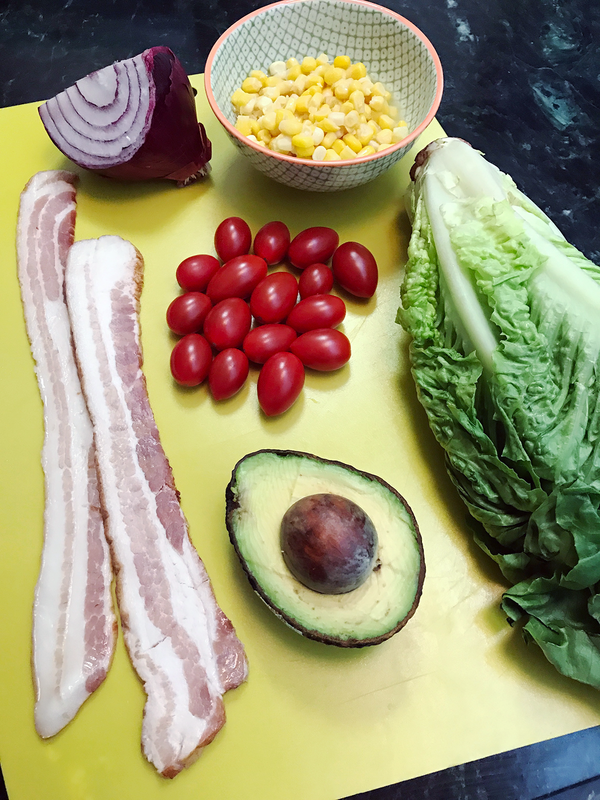 The sweet and savory honey mustard chicken, creamy avocado, crispy bacon, and fresh cherry tomatoes and corn work really well together, and there's an awesome balance of flavors and textures. It was actually very filling, unlike many other salads I have tried, which leave me wanting more food. My biggest complaint (and the main reason why I probably wouldn't make this recipe again), is that it turned out to be pretty expensive, at least by NYC standards. 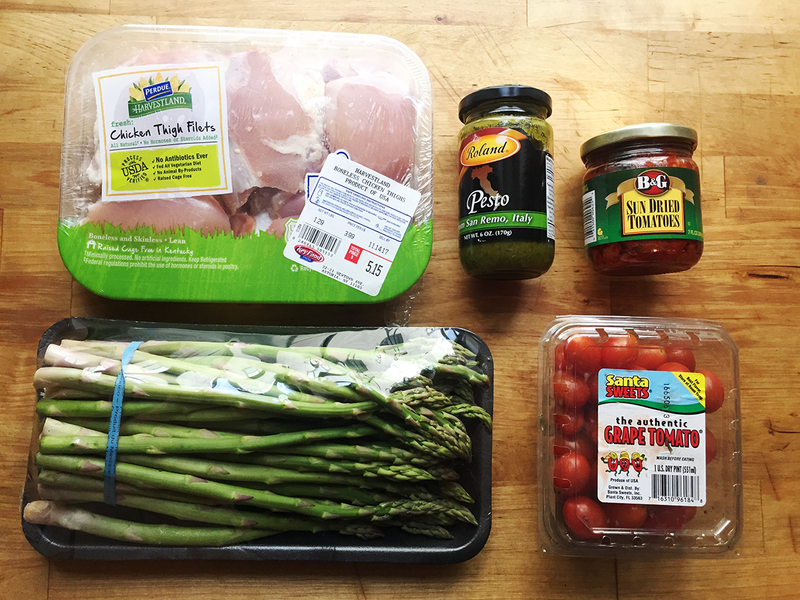 Between buying bacon, chicken breasts, and two types of mustards for the marinade, I ended up spending more than I usually spend on a home-cooked dinner. The ultimate verdict: Make this salad if you're craving something healthy-ish that still feels indulgent. It's a solid, feel-good weeknight dinner. 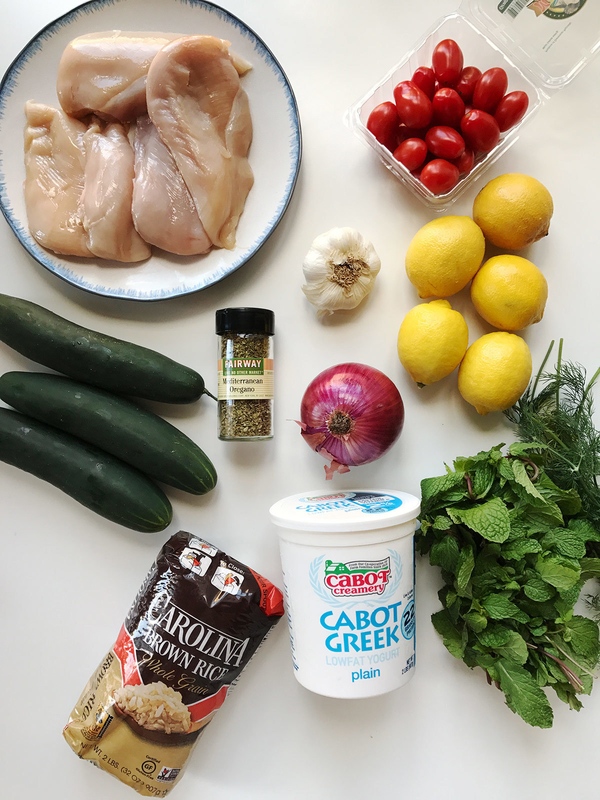 What she thought: There are days I wish I lived like this: a couple hours away from my family, in a home with a kitchen that has a huge fridge that I keep regularly stocked with Greek yogurt, grilled chicken, and cilantro. 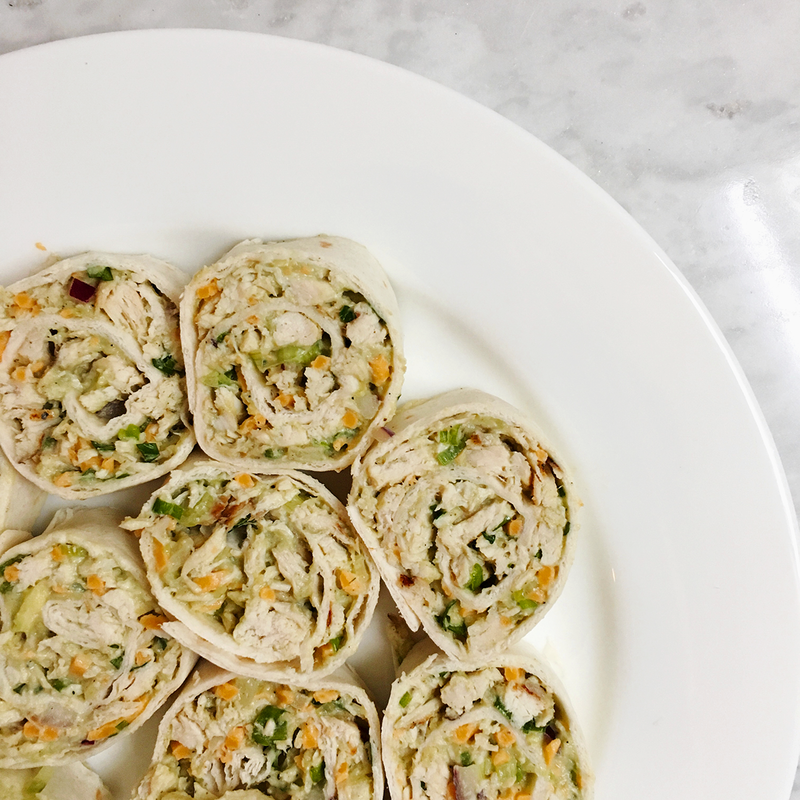 In that fantasy, some of my family's going to show up early, and I'd knock these wraps out as a perfect welcome snack. 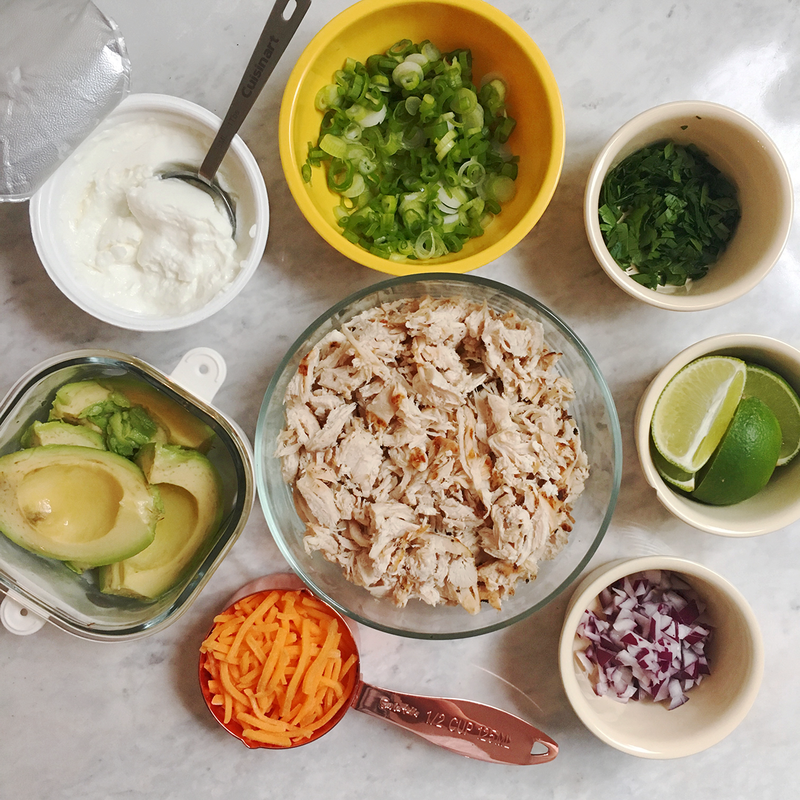 To make 'em, you chop some stuff up, squeeze some limes, mix it all together in a bowl, spread it on tortillas, roll up those tortillas, and slice. (You *definitely* have to chill them for 30 minutes before you can slice. So if you make them for your family or friends, start about an hour before everyone's supposed to arrive.) 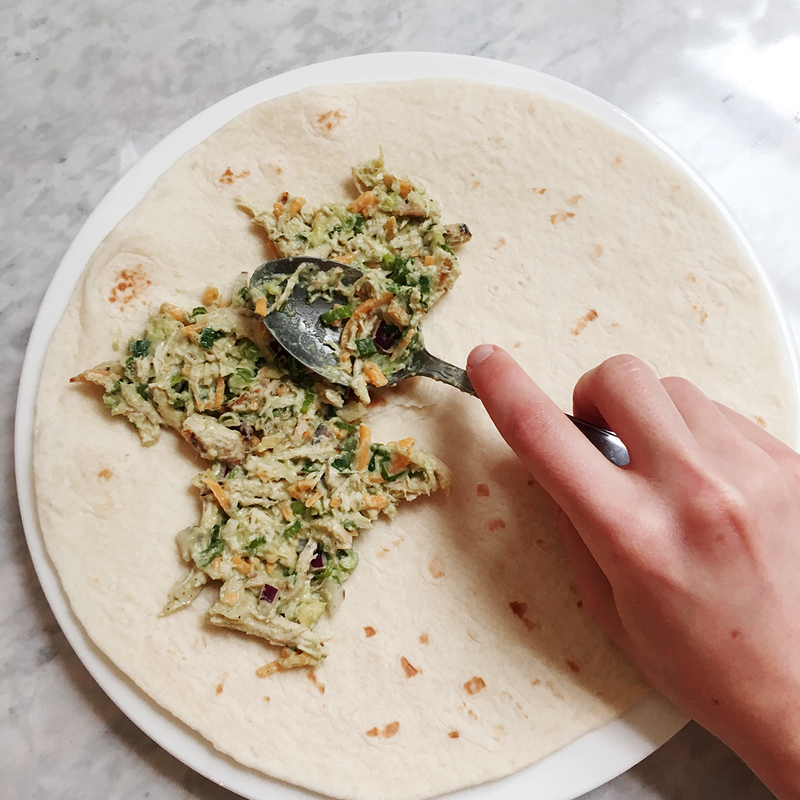 The easily doubled recipe fills two 10-inch tortillas, which slice into eight or nine bites each, plus two semi-stuffed end bits that are mostly tortilla. That's all to say, they're tasty, but not mind blowing, relatively healthy (no mayo! ), and quick to make — but that depends on how many ingredients you have on hand and your basic knife skills. They're filling finger foods that most people will happily eat. If I make them again, I'll swap out a clove of crushed fresh garlic for the garlic powder and serve with some hot sauce. Or go the extra lazy (if decidedly higher fat) route of my favorite store-bought chicken salad. What she thought: First thing you should know about this recipe is that it definitely won't take you 30 minutes to make it, as advertised on the site. 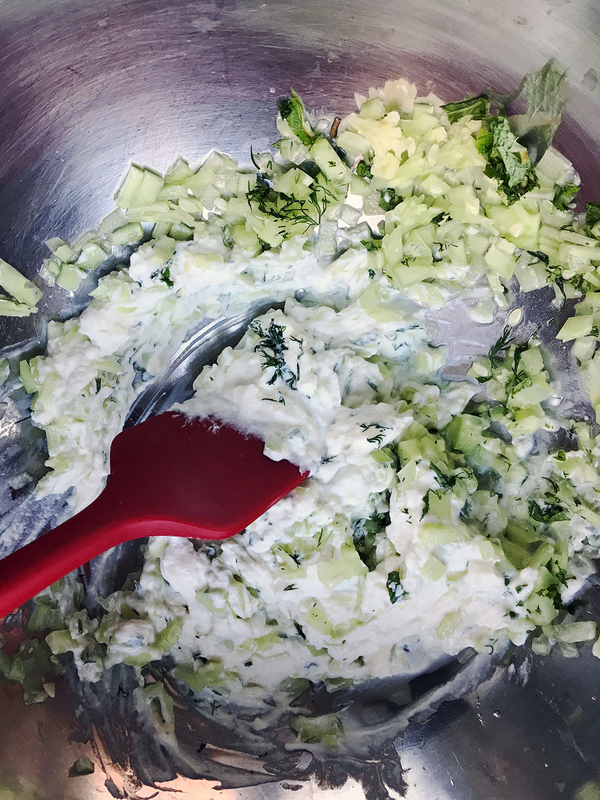 There are several things to prep and the whole thing is pretty involved: You need to marinate the chicken for at least 20 minutes, then cook it, make the tzatziki sauce, put together the cucumber salad, cook the rice, and prep the other ingredients that complete the grain bowl. I marinated the chicken for two hours and it was pretty delicious, but if I had to do it again, I'd marinate it overnight so it gets even more flavorful. My boyfriend, who likes his food on the spicier side, did add hot sauce to his, but he loved it otherwise. I'd keep the rest of the recipe as is. It all came together nicely and tasted really good.